BEVERLY – It remains the area’s premier holiday show, unchallenged and still undefeated, and seemingly rolling on forever, the Ol’ Man River of Christmas entertainment. The North Shore Music Theatre’s 26th annual production of “A Christmas Carol” still enchants and entertains, a magical mix of music, dance, and special effects that help bring to life Charles Dickens’ enduring classic. The current edition is a good as ever, and there are three major reason the show has always worked, and probably will continue to work. 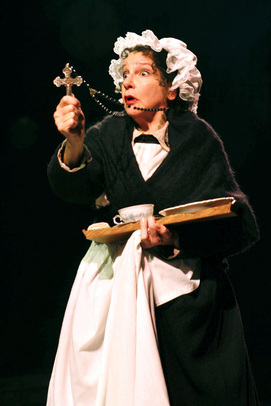 The adaptation by former NSMT Artistic Director Jon Kimbell and members of his NSMT staff inserts some twists and turns into the Dickens tale– it takes place in 1863, with a narrator looking back 20 years to the Christmas Eve when notorious miser Ebenezer Scrooge was visited by three spirits. The narrator himself (Tommy Labanaris) will later figure into the plot. There is a generous amount of music – much of it period, but some original, beautifully performed under the musical direction of Milton Granger, with the costumed musicians at times becoming part of the action, which includes several large production numbers. The production values remain spectacular, with sumptuous costumes, great special effects, and a number of effective projections. And, last but certainly not least, a nonpareil performance by Texan David Coffee in the lead role of Ebenezer Scrooge. Coffee has long since earned the right to have his 23rd entrance as Scrooge at NSMT greeted by applause – a theatrical honor reserved only for special performers. The show benefits from the great warmth projected by Russell Garrett as Bob Cratchit, and by Leigh Barrett as Mrs. Cratchit and the Ghost of Christmas Past, and any show that finds a way to give Barrett two songs – as this one does – is OK in my book. Peter S. Adams brings hearty good Christmas cheer as the Ghost of Christmas Present and Bronson Norris Murphy is in fine humor and voice as Scrooge’s nephew, Fred, whose entreaties to Scrooge to join him for Christmas are ignored. J.T. Turner is a fine-humored Fezziwig. Britney Morello has two strong turns as Belle, Scrooge’s fiancee who returns his ring, as Scrooge dooms himself to a life alone, and Fred’s bride Meg. Brady Miller and Brad Trump are the energetic Pearlies, two free, athletic spirits who were also inserted as part of NSMT’s adaptation. Will Ray raises the roof as Jacob Marley, Scrooge’s late partner who returns as a spirit, frighteningly fettered, scaring the daylights out of old and young alike. Director/choreographer Kevin Hill steers the ship confidently forward, building on past successes. With the number of those attending this production well over one million, this adaptation is the gift that has kept on giving to the theater, even after it closed and re-opened under the aegis of Bill Hanney, who has kept the torch lit. It is a show steeped in tradition but with enough surprises to satisfy the return customer. Kimbell – the founder of the feast – was in attendance on opening night, satisfied that what he and his staff created has stood the test of time. Don’t run out at the end of the show. After the curtain calls, expect Coffee to take his annual “victory lap” – a tradition he began on a snowy evening years ago – around the stage, greeting old and new friends. This critic has been fortunate enough to have seen all of his incarnations as Scrooge and as someone who has attended this “Carol” for a quarter-century, I can say it isn’t getting old, even if I am. 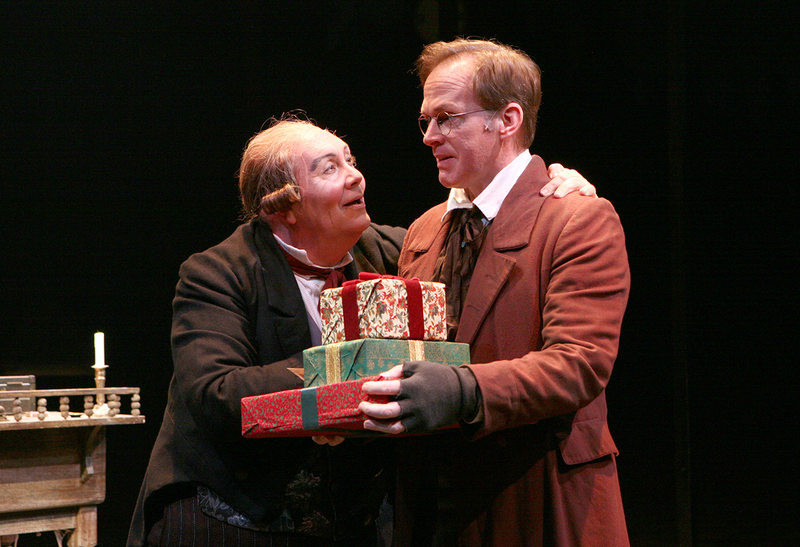 The North Shore Music Theatre production of Charles Dickens’ “A Christmas Carol.” Adapted by Jon Kimbell, assisted by David James and David Zoffoli. Original music composed and arranged by Alby Potts and James Woodland. Directed and choreographed by Kevin P. Hill. At the North Shore Music Theatre through Dec. 23. http://www.nsmt.org.